I have written previously about how IMPOSSIBLE it is for a Professor to ‘relax’: the work-life balance is tricky and it’s very difficult to find time to take a deep breath, go for a walk, or have a calm and long discussion with a colleague. Well, something happened that is causing me to reconsider my stance. In mid-March, I was invited to travel to Cape Breton University to give a couple of talks to their professors about the ‘publication game’ in Academia, and about the use of social media in Universities. It was a wonderful trip, and I managed to get a little birding done, too. However, I must be honest in saying that I was in rush to get the talks completed on the weekend before leaving, there was grading to finish up, reviews to complete, and I have two MSc students wrapping up their projects and was trying to get thesis drafts edited – I was being pulled in many directions and was rush-rush-rushing around, as usual. So, when finally getting back to the Montreal airport late on a Tuesday night (and after a rather impressive snowstorm in Montreal that day), instead of slowly and calming walking to my car, I ‘jogged’ to the car, slipped on a snowy curb, and dislocated my shoulder. Yeah, it hurt. A lot. It’s an on old injury that was re-injured that night. After the emergency room visit, I stayed home for a couple of days and couldn’t do much other than sit on the couch. It was nice. It also gave me a bit of time to reflect on how I live my life, and how I always rush around doing too many things. 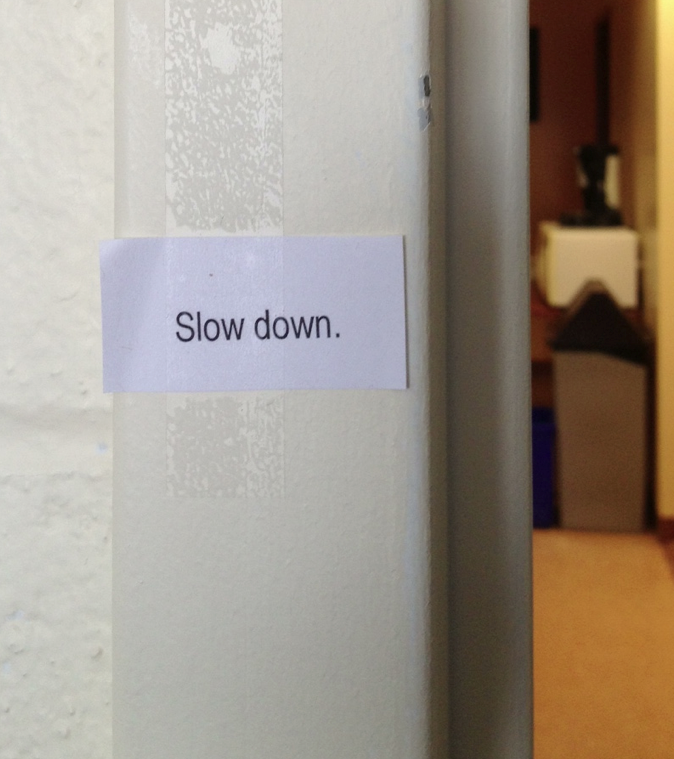 My wife, who is my rock, a no-nonsense person, and a clear thinker, said to me: “Chris, you need to slow down“. She was right: If I had gone a little slower, I wouldn’t have injured my arm. I’m not exactly sure why I rush everywhere (partly a personality trait…?). Going quickly does not lead to a more productive or happy life. Going quickly makes you miss things and do jobs poorly. Rushing around makes me spend too little time on the important parts of life and instead I work to check-off to-do lists. As a friend of mine said on a drive home the other day, I don’t want a gravestone to read “Chris Buddle, he got 308 things done today!”. I need to take time to take things slower, stop and listen to my students, my friends, and most importantly, my family. A dislocated shoulder is a very small injury – something much worse could happen because of my behaviour of dashing around from one thing to another. So, I am proposing that I will try to “slow down“. Perhaps by writing this (personal) post, it will cause others to take a deep breath, and go through their own lives as a more measured pace. I will still have too many things to do, and will be overworked, but I am going to try to change my overall philosophy and move through my life one step at a time. I want to start to see the world as a saunter through a forest instead of a mad dash across a busy street. Maybe every now and then I will go for a walk at lunch (with binoculars) and try to pay a little more attention to my surroundings. I hope this will stick, but those of you that know me realize that this will not be an easy task. 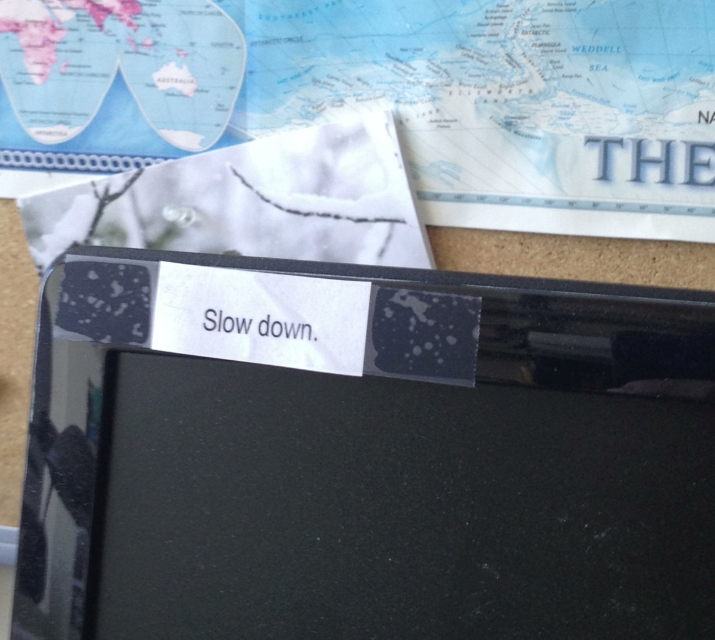 Here’s how I have decided to remind myself of this new motto: I have printed out little ‘slow down’ signs and have proceeded to tape them up all over the place. Slow Down! An eye-level sign, as you leave my office. This process started last week, and it is helping. These continual reminders are useful, and causing me to consider whether I should walk slowly and calmly to the next meeting. Or whether it really matters if I’m 2 minutes late getting home, or whether it really matters if I finish that e-mail NOW instead of later. I am enjoying this slower approach to life. Let’s hope I can maintain this philosophy – heck, maybe it really is possible to insert a little more ‘relaxation’ into every day. Do you go slowly through this world? Should you? What strategies can you recommend? Slow Down! …a reminder taped to the corner of my computer monitor.